I keep reading the fancy accounts of serious fashion bloggers and their fabulous escapades to fashion weeks around the globe. Pretty amazing stuff ... the opportunity to actually participate in these extraordinary events in fashion; right there before your eyes. 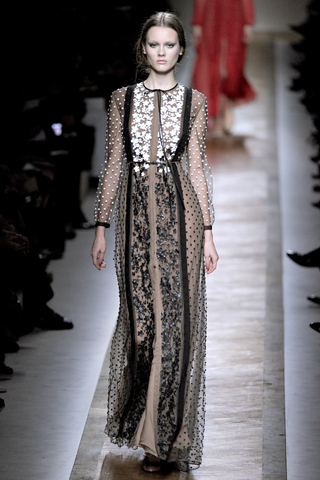 This is Valentino's Spring 2011 collection and it's just so beautiful. Its obvious that I have a thing for diaphanous chiffonery, as I feature such lovelies again and again. But each time I see a show like this, I can't help but swoon a little.